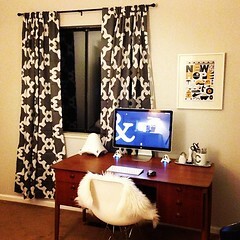 I got some new curtains for my office from ZGallerie last night! I loved the chevron ones from Etsy, but the fact they just weren’t wide enough really bothered me. I also got 90% of the trim painted in the office. Joshua installed our new cooktop on Wednesday. 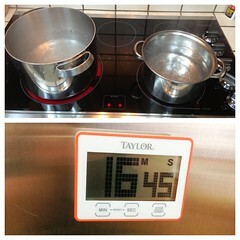 It took about 17 minutes to boil a 4 quart versus 45 minutes on our old gas cooktop. I am VERY happy! 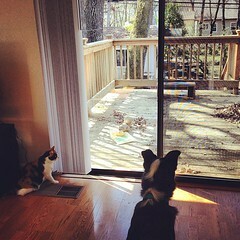 On Monday Izzie and Tucker spent 3 hours watching a squirrel tear into a bag of bird food on the back deck. Too funny! 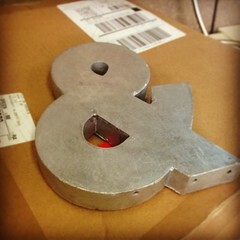 My zinc letters from Anthropologie arrived on Valentine’s Day. I ordered “J & C” for my relationship timeline wall.